Even seniors living life free of chronic conditions and disease can experience changes in certain mental capacities. It's a natural part of growing older. In fact, most people describe declines in memory for names and recent events as they age. But when such lapses create health and quality-of-life issues that affect their ability to remain active, it's time to seek help. Montefiore is the University Hospital for Albert Einstein College of Medicine. As such, we are committed to translating pioneering scientific discoveries and cutting-edge research into exciting new treatments and therapies. We invite you to learn more about the Montefiore Einstein Center for the Aging Brain, meet our team of highly trained physicians, and contact us for more information on the many services and treatments we offer. 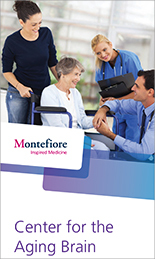 The Montefiore Einstein Center for the Aging Brain accepts most forms of insurance. We are easily accessible by car or public transportation. Garage parking is available on-site.